A custom mannequin and themed display for this original Captain America costume worn by Chris Evans in the movie Captain America: The First Avenger. 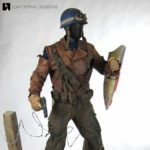 This Captain America costume is worn by Steve Rogers on the battlefield, when he goes to rescue Bucky and the other captured soldiers from HYDRA. 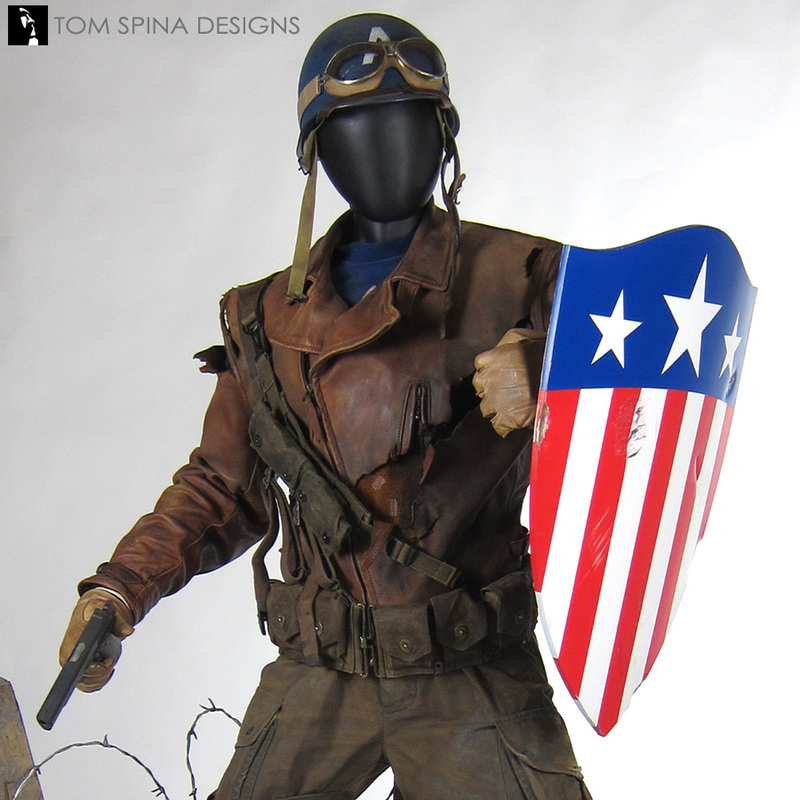 It’s a wonderful combination of both his iconic red white and blue costume as well as elements of WWII era clothing, and with the vintage shield as well! 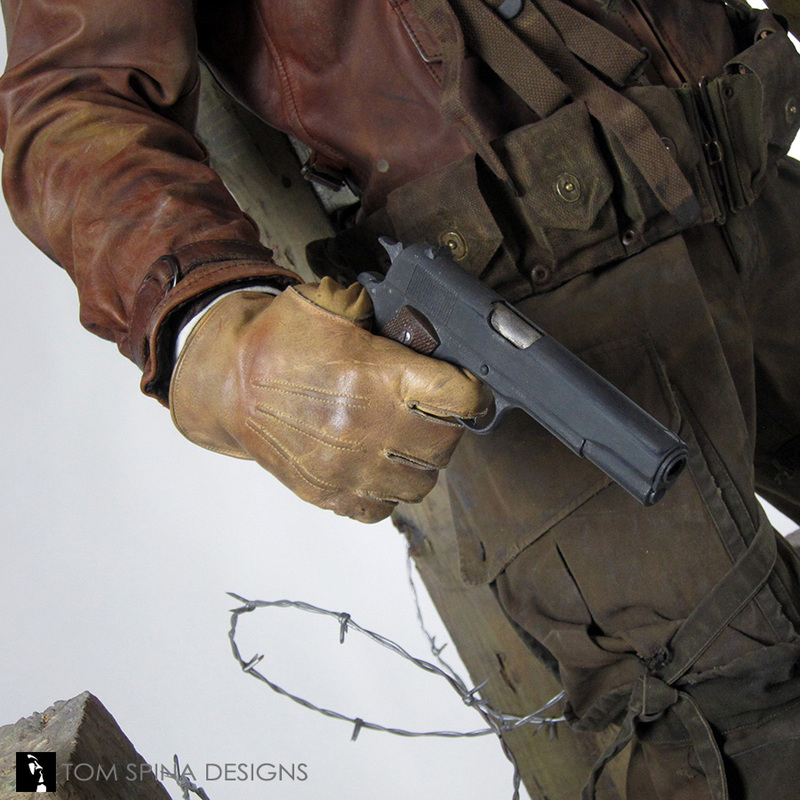 The many layers of this screen used movie costume were a challenge when coming up with a safe way to support the dynamically posed custom mannequin. 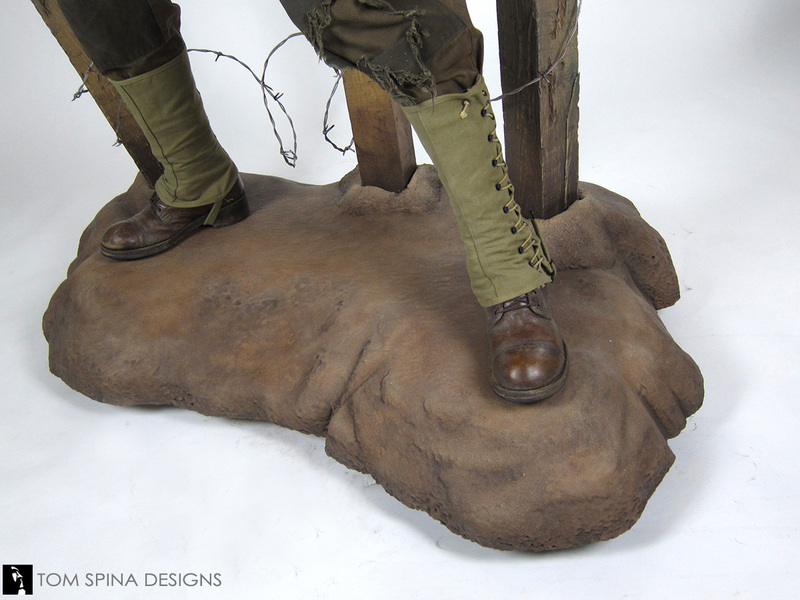 The movie-worn boots could not be drilled for a post, and the spats which go over the boots made it impossible to use a calf bracket which would be a “normal” mannequin solution when a costume has the original shoes. 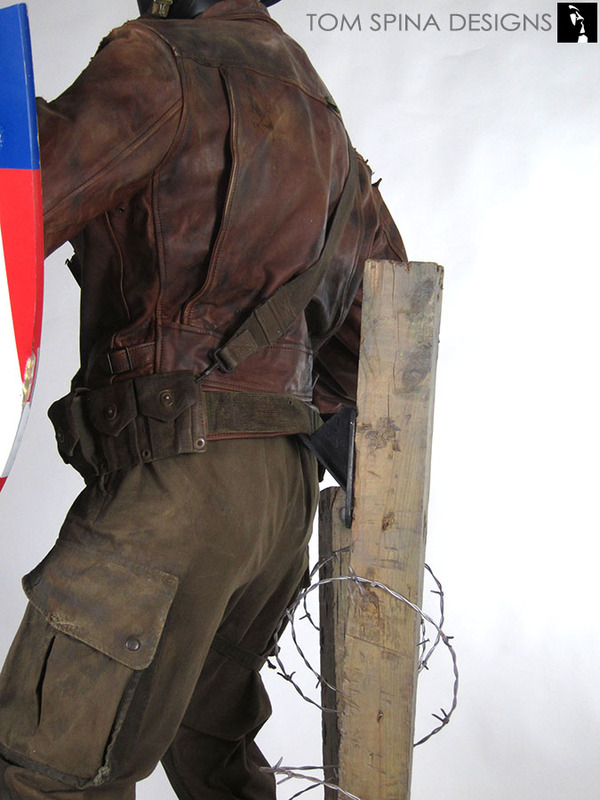 With this display we used our theming… one of the “fence posts” as a way to disguise the support. 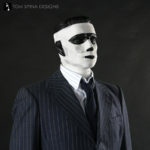 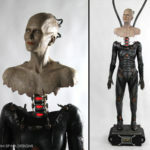 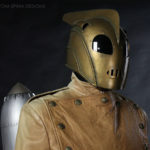 The center post hides a custom welded bracket which fits under the jacket and connects to a point at the back of the mannequin. 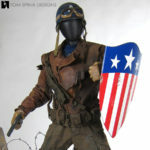 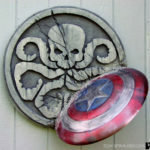 Other challenges were creating a means of supporting the heavy metal Captain America shield while still allowing for dressing of the complex costume. 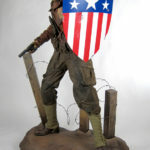 A faceless head allows the original movie costume to be the star of this display. 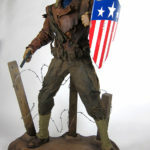 Since this wardrobe was from the movie’s iconic 1940’s battlefield scene, we chose to use that as the inspiration for Cap’s themed display base. 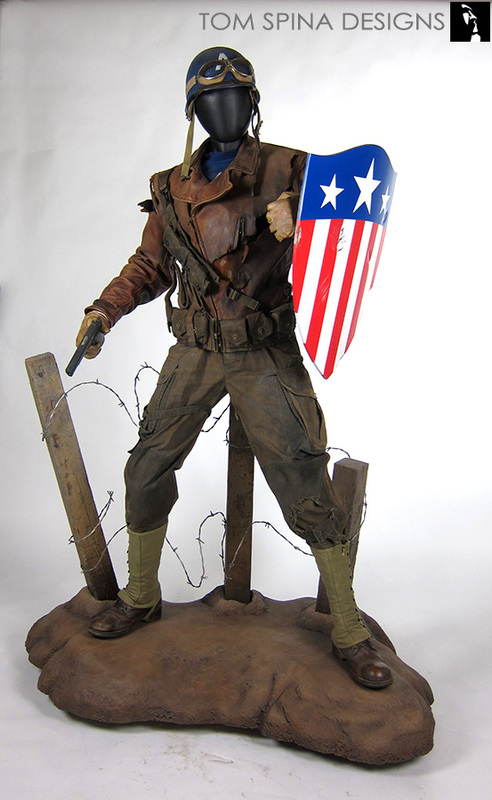 The statue sits atop a faux dirt mound carved from EPS (or styrofoam) which was hard coated with a thick resin layer for ultra durability. 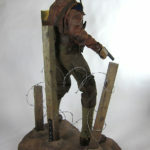 The mannequin’s base has holes for the 3 wooden posts, with the central post (the one that bears the weight of the mannequin) hiding additional a custom welded flange. 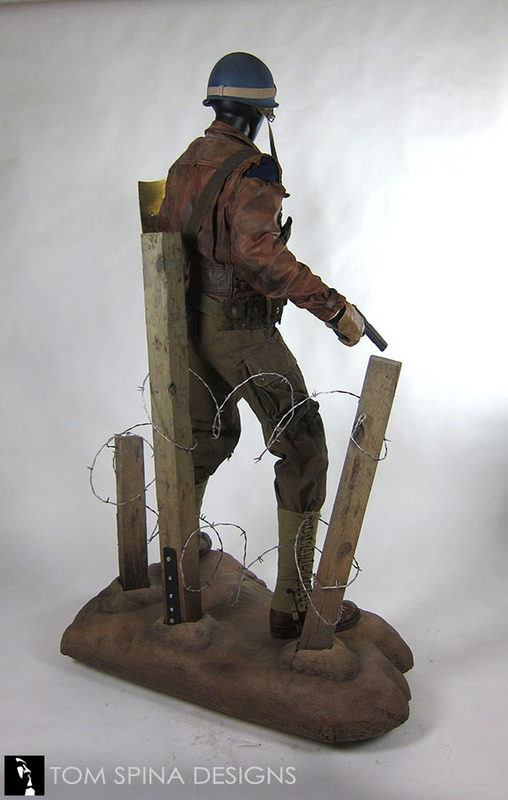 We then painted the base to have a realistic earthy feel. We also distressed the wooden posts as well as adding faux (rubber tipped) movie style barbed wire for a safer alternative to the real thing! 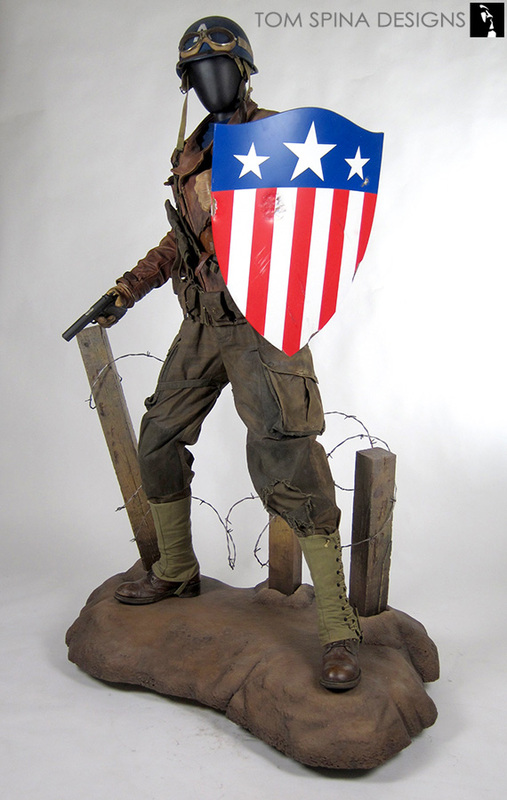 The finished display captures the feel of the First Avenger and brings this rare complete original costume to life! 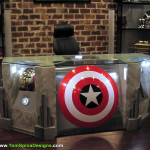 Love superheroes, but haven't seen Captain America yet?